It was just an another Saturday night as Nicki Minaj was chillin’ out on Twitter, announcing the details of a new contest where a lucky fan will meet Nicki in her very own Recording Studio. 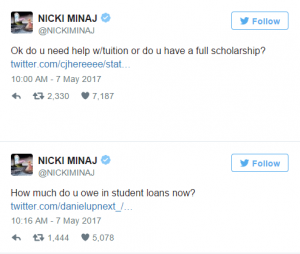 Least did Nicki know that by the time she gets out of twitter,she will loose more than $20,000 to a few smart but cash-strapped college students, unable to repay their educational loan or others seeking admissions to new courses but don’t have enough money to pay for the new courses. 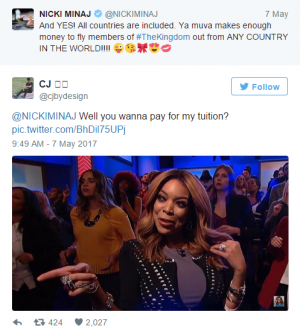 It all started when Nicki was boasting (sort of) that she could fly the Contest winner from any part of the world, when a broken college student asked her,if she is willing to pay his college fees. As many students joined in, the college student’s tweet became viral with more than 2000 likes and 427 retweets.After a brief pause, “Light My Body Up” singer finally agreed but with a set of rules. 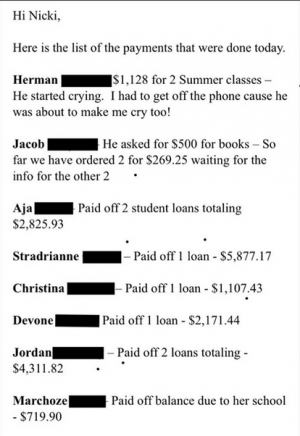 The qualifying students must send screenshots of their GPA assessments & financial aid statements to Nicki, only those students with straigth A’s were given the donation while a few lucky ones pursuing new courses, also got a cut. Nicki is not the first celebrity to donate funds to deserving college students, as Beyonce has been formally doing it with her Lemonade scholarship, which started functioning on the 26th of April, 2017. But Nicki Minaj is indeed the only celebrity to instantly reward the deserving students as $1000s where instantly transferred to student’s bank accounts via online banking. One can’t help but think of the blockbuster movie, Now You See Mee Part 1, where the audience received $1000s in their bank accounts without any prior announcement, at the end of the magic show.